Get envelope printing at competitive prices! Here at NextDayFlyers, we print envelopes in many popular and common sizes, including #9, #10, A2, A6, A7, 6" x 9" and 9" x 12". Use them to mail anything from letters, statements and marketing materials to greeting cards and invitations. Boost your brand identity with full color envelopes printed on premium 70 lb. white paper. If budget is a concern, we also have economical 1-color envelopes printed on standard 24lb. white paper. 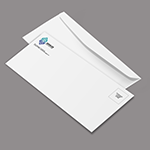 These printed envelopes can run on inkjet and laser printers, making addressing a breeze. To help you get started with your design, we have templates available on our website that you can download. They contain digital specifications and can be opened in common design programs such as Illustrator, InDesign, and Photoshop. By using these templates, you can be sure that you’ll have the right information on bleed, safety zone, color profiles, trim marks, and file size. Once we receive your order, you can be certain you’ll get a high-quality finished product. When you send business correspondence to someone - whether it’s a proposal, an invoice, a quote, or a follow-up letter - you want to make a good impression. An envelope is the first point of contact with your customer, client, or prospect. When that person picks up the envelope with your message in it they are, in effect, shaking hands with your brand. 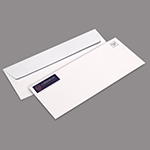 Printed envelopes, along with letterhead, are an important part of any business identity program. These pieces help establish your business in the minds of your partners, clients, and community. They polish your professional image and add to your reputation as a trusted business entity. The visual cues on a custom printed envelope also help recipients distinguish your correspondence from junk mail. If your proposal lands on a decision-maker’s desk in a branded envelope, you already have an edge over competitors who sent their proposals in plain envelope. When designing your envelope, consider adding a unique element that represents your business - something beyond your name, address, and logo. If you have any visual elements on your business signage, you might want to reproduce some part of that on the envelope. Consider including your company motto or website on your envelope design. If you want to get your recipient’s attention, try putting your unique element in a surprising place, like on the bottom edge of the envelope. When trying out more unconventional envelope designs, it’s always a good idea to review your design placement to make sure it’s within postal regulations. It won’t cost you anything to consult with a Mailpiece Design Analyst at your local post office, but you might want to call ahead to make an appointment.